I had to take a salad for a family get together and thought this colourful salad would be a great addition. Using vegetables I had in my fridge, I put together this salad quite easily, though it can be a little time consuming to take the time to cut everything in bite size pieces. However, the results were well worth it. You can use a combination of any vegetables that you like. I mixed in the dressing and bread just before we were ready to eat in order to avoid everything getting soggy to early. But I did enjoy eating the salad with the slightly soggy bread the next day as well. 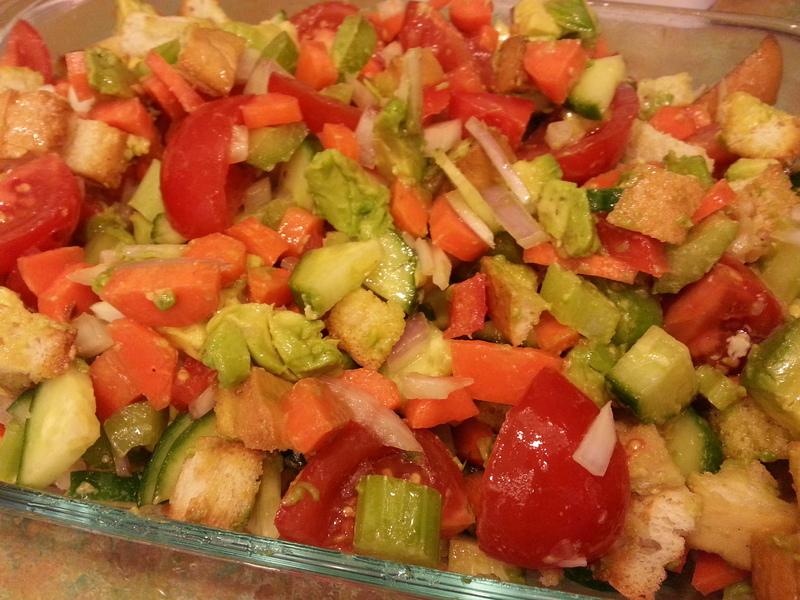 This salad makes a great base for a meal especially on a hot day. If possible let the dressing sit for awhile to allow all the flavours to combine. 3. Add in salad dressing.